Heart and Sole: Major gear decisions: going semi-"ultra-light"
Backpack: I own a real workhorse of a mountaineering pack: Osprey Aeather 70, which is great for carrying huge loads (60 to 80 pounds) *very comfortably* up mountainsides from base camp to high camp. But it weighs five pounds empty. Instead I'm going to use my 1.5 pound 40 year old REI day pack shown above. 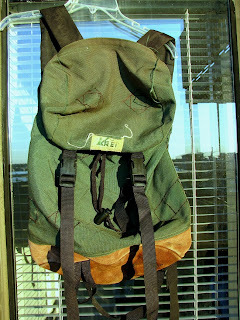 I bought it at the REI store in Fort Collins, Colorado in 1970 or 71 and have used it on thousands of hikes and outings, yet it still has no tears or holes and is as comfortable as an old shoe. It has about 1/3 the capacity of my Aether 70, but with the other gear choices, it ought to be sufficient--will be testing it in advance, of course. Sleeping bag: none! I'll sleep in extra clothes on my Therma-Rest closed cell ground pad. Tent: Large size 11 ounce rain poncho will double as a tarp and tent on rainy or damp nights, otherwise I'll sleep cowboy-style (under the stars). Beneath me I will use a simple shower curtain liner as a ground cover--inspired specifically by Granny Gatewood. Speaking of old shoes: I'll be using running/walking shoes (about two pounds)--will buy one new pair of trail running shoes but also have three pairs that have already walked the AT extensively, including some very rocky sections. They work fine for me. Hydration: No heavy Nalgene bottles - will be using the commercial half-liter water bottles made of minimal plastic. Nalgene is great if you want to pour boiling water into it and mix stuff (or use it inside the sleeping bag to keep your feet warm on a frigid high-altitude night), but otherwise it's just excess packaging. I am going to 'splurge' and carry a water pump/filter rather than the much lighter alternative of treatment tablets--want to enjoy the taste of the pure mountain water that is abundant along the AT. Clothing: One change only--still debating whether to carry heavy fleece vs. ultra-light down. The latter loses loft when wet and could be the express route to hypothermia. I may experiment with both during the cold early months. Down will be the clear choice for temperatures below freezing, but when it comes to cold winter rains ... well, I've experienced what it's like to be under-dressed and soaked to the bone during 40 degree unrelenting rain on the AT, and it's not something I want to go through again! Weight concessions: I will be carrying my Garmin GPS and a decent Canon digital camera with 8x zoom. Each weighs about a pound, but I'm a data freak and also want a good documentation of the experience. I'll also carry paper and pen for field journal notes to be later transcribed to my digital journal here (and my personal journal, kept daily since 1979). More details on gear will follow. Meanwhile I continue to hike the beach daily here in NC. In September I logged 250 total miles of beach hiking, walking the entire length of Topsail Island (26 miles) ten times. The only problem with beach walking is that I'm actually beginning to miss the thru-hiker's bane: the PUD's - "Pointless Ups and Downs" that the AT is so notorious for. I am very excited for you at your last journey and though I wish I could tag along, I will enjoy following your via your posts!